Avente Tile customer Constance Zaytoun recently designed and oversaw the remodeling of her Chelsea, NY, kitchen that included a cement tile backsplash to be envied. She and her husband, Marc Weitz, embarked on a journey about a year ago to make their humble Chelsea kitchen into nothing short of stunning! They had a vision, a goal and a budget, and they achieved just about everything they had wanted to with their project. 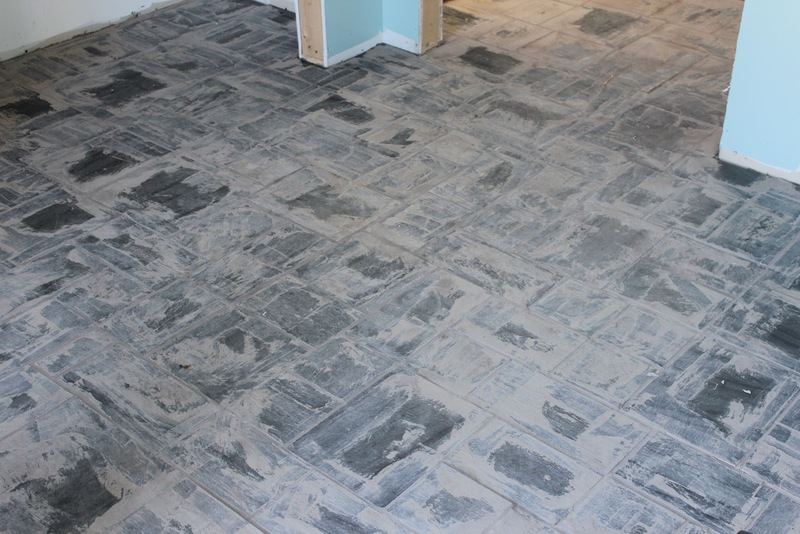 Constance says, "It was pretty darn exciting to see the tile up on the walls! There were many folks who were concerned that these thick cement tiles would not work on a wall, and I am so grateful that they were wrong. The Polk Gold molding frames the Romana pattern and gives some added dimension beside that high wall of tile. Given that the Romana tile was the one element that pulled together all of our design choices, it was ironic that it was the very last thing to be installed and so wonderful to see our vision finally fulfilled in its entirety." See more photos of the kitchen in our prior post A Cement Tile Kitchen Backsplash Makes a Chelsea Remodel, and in our Design Idea Romana Cement Tile Makes for Eye-Popping Backsplash. Constance also offers cost-effective and time-saving tips in a recent interview I had with her, Secrets of a Successful Kitchen Remodel with Cement Tile. If you are considering cement tiles for a small project, use tiles that are in-stock to save money. Color substitutions, custom colors and patterns can double or triple the cost on small projects. Because a residential backsplash, bath floor or fireplace requires less than 50 square feet, using stocked tiles in standard colorways will save money. The cost of design, color chips, molds, and samples is easier to justify on a large project and will only add 10% to the project. There's no need to worry. We have hundreds of patterned and solid color cement tiles that will work for any style of decor. We maintain inventory on most Cuban Heritage Patterns, common Heritage Solid Color tiles, most Classic Cement Tile Patterns and common Classic Solid colors. Give us a call to confirm inventory, availability and options. Considering cement tile for your next home project? Let us help you find some inspiration. Visit our cement tile design ideas. Subscribe to Tile Talk News and receive our monthly newsletter, Tile Talk. 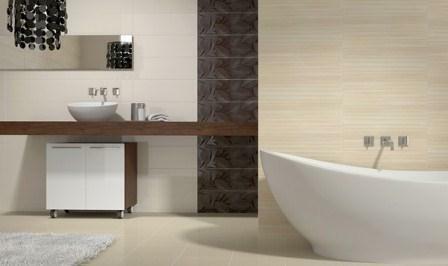 You'll find great design ideas, tile tips, and information about new products. We'll also notify you of special promotions that are only offered to our subscribers. How and where would you use the Romana cement tile? Or, would you choose a different pattern? 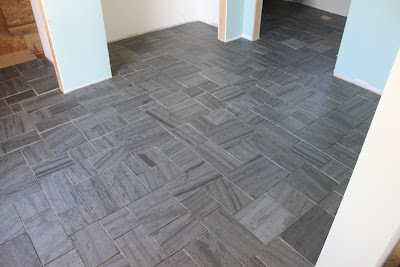 For the present project that we are working on Vermont slate tile was chosen for the mudroom entry way as well as the half bathroom that is attached to it. Now this slate comes in an assortment of sizes so laying out the floor isn't as easy as you would get in a standard tile floor. There really is no pattern and the trick is to vary the sizes and to make sure you break the lines so it keeps the random look. But let's start at the beginning of the process. 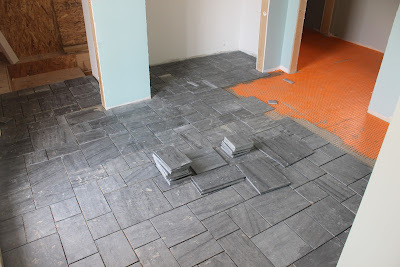 We were going to be using Ditra by Schluter for the layer in between the subfloor and the tile and, to be honest, I have only installed this type of slate once before and it was a long time ago- long before Ditra was around. With that in mind I decided it might be a good idea to see what Schluter had to say on the topic and I'm glad I did. Because slate is a natural stone product it is not as strong as certain other tiles, Schluter said that we needed to add another layer of plywood before we proceeded and so a new layer of 3/8" plywood was added to the 3/4" layer. Once that was done we could proceed. As you can see the new layer has been attached and now for the layer of thin-set. Now for a very important point. This layer of thinset, below the Ditra, can be a Latex P.C mortar but you cannot use this on the layer between the Ditra and the tile or slate. For that layer of thin-set, it must be an unmodified thin-set mortar. 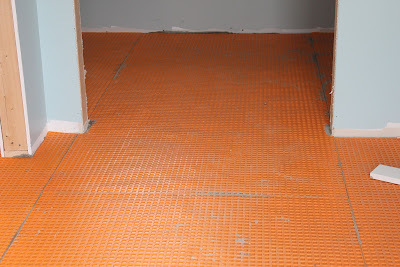 Here's the reason- the latex thin-set when sandwiched between the plastic of the Ditra and the above tile may take days or may never dry because there is isn't enough absorption or air flow to cure it. As you can see we have avoided two potentially huge problems by making sure that we followed the manufacturer's recommendations. We are now ready to start laying the slate. We decided that we would start at the most visible area which was by the entry and entrance into the kitchen. Laying this type of slate is tricky because it's so easy to get into the habit of not looking for lines developing in many directions. As you go along a line develops and then you have to choose what tile pieces to add to break it. It's very much like doing a puzzle but you are making it. The next step of course is the grout or is it? Potential problem number three. 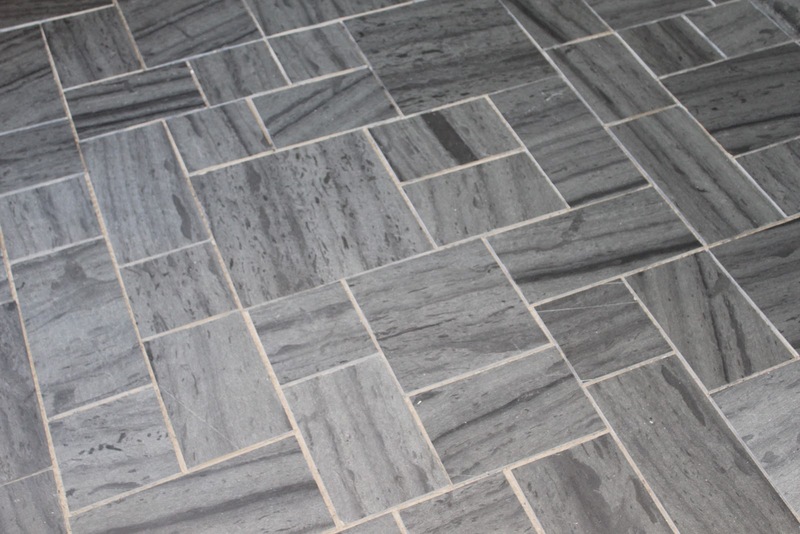 Slate is a natural stone and you have to seal it before you grout. The sealer is applied and then left to dry for 12 hours. 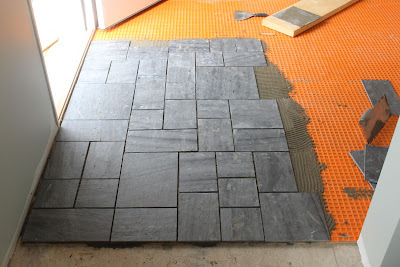 This way, after you apply the grout, it will be easier to clean off the slate and won't stain them. 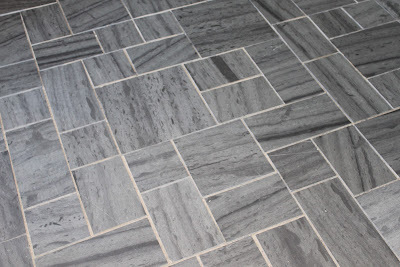 Slate is not a perfectly flat, smooth surface so cleaning off the grout from the cracks, crevices and irregularities can be a bit of work and even after will require a few additional washings before the finish sealer is applied. 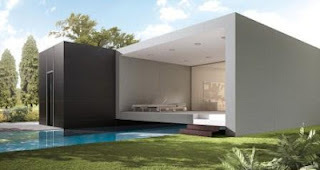 Yet when it is finished, it provides a unique and durable floor. 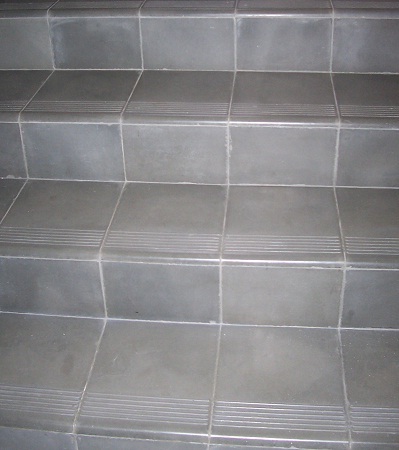 When considering handmade cement tile for an installation, customers often ask, "How do I finish a stair riser or stair tread with cement tile?" 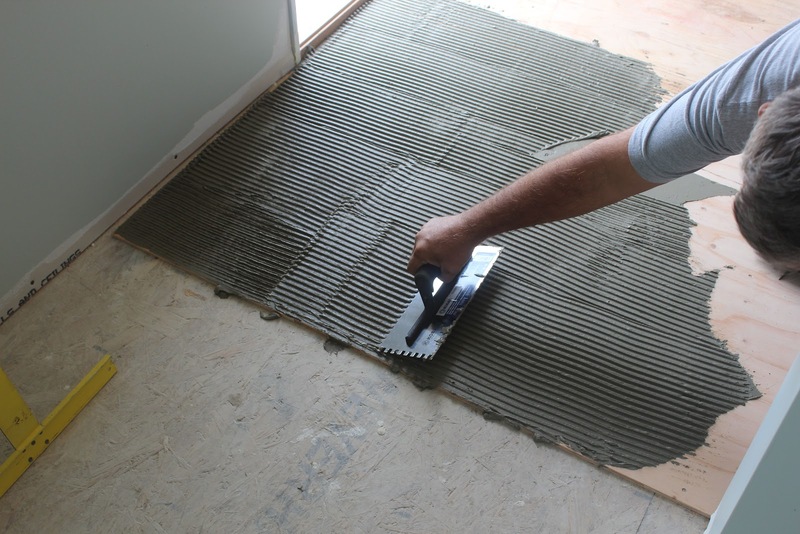 The question most often occurs when we are discussing cement tile trim, molding and finished edges. 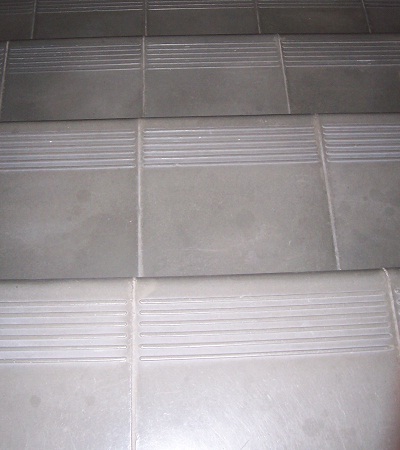 So when considering an installation for a landing or stairway, I recommend cement tile treads and risers. The tread is only available in solid colors. Generally, the tread color should match the solid color used to fill the area outside of the pattern and border. Match the height of the cement tile riser to the stair height to avoid cuts. Don't forget the riser is "sandwiched" between the back top of one tread and the front bottom bullnose of another tread. If you are creative, consider patterned cement tiles for the riser; however, you'll probably need to cut the tiles since most stair risers are between 5" and 6" high. This will alter the pattern and create a different and complimentary look. You can also use decorative ceramic tiles or field tile for the stair riser. Handmade cement tile – whether functional stair treads or decorative tiles - offers both design creativity and functional solutions that you won't find with most other tiles. Let us help you explore the possibilities of cement tile. Take a look at some of Avente's cement tile and concrete tile design ideas and you'll discover your own unique style. Will you let us know which you love most? I will never forget the first time I saw a relief cement tile. The texture was artistically integrated into the pattern to add a complexity to the floor tile. 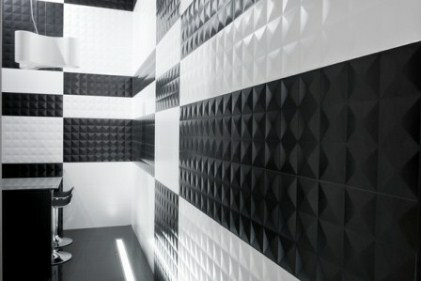 The tile stood out like a little gem and the texture on the surface provided depth and sophistication. Relief cement tile are not commonly found here in the United States. Installations are often limited to monochromatic geometric patterns for pool decks, sidewalks, and utility room floors. These tiles and designs don't capture the stunning sculpture or clever subterfuge that you'll find in today's cement tile relief designs. 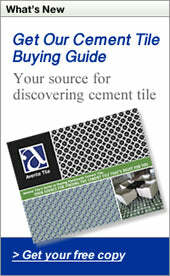 Today, I’m pleased to share two relief cement tile designs that are now available from Avente Tile. One is the historical Roseton pattern in two colorways. This is the pattern that first captivated me a few years back when I saw a relief cement tile. It’s easy to see why when you gaze at the the detail in the photo. 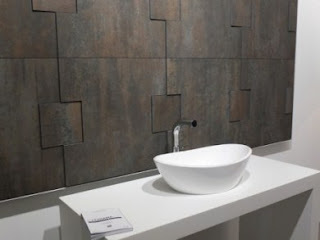 Although generally used as a flooring tile, these tiles are best suited to "working their magic" on a wall application where you are easily tempted to touch and feel the sculptured, textured design. Because the colored segments of any cement tile are hand poured in a mold, it’s easy to change the colors once the mold has been created. So, these classic patterns are easily transitioned to any color scheme. Is it cement or is it clay? Cement tile do an amazing job at impersonating terra cotta and clay tiles. In fact, it’s almost impossible for anybody to tell the difference once installed and cement offers a lot of advantages. This classic Spanish colonial tile body in a Moorish design is seamlessly translated into a square body cement tile with the option of different colors including a faux grout line. Cement allows you to customize colors and still use a traditional pattern to maintain a specific style! Colonial Pavers are simulated with cement tile in this monochromatic color design. Spice it up with color and texture using cement tile. Here two colors were used for the "terracotta body" and the black grout line is in relief. The square body cement tiles are quicker and easier to install and a narrow grout line ensures the the classic geometry is maintained. 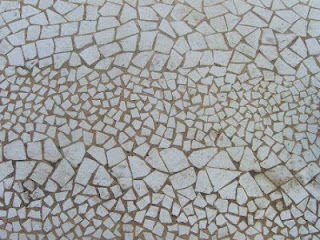 If you are thinking of using Spanish-style pavers or terracotta for your floor, consider what you can do with cement! In my last post, Spanish Tile as Building Material, Part 2, I focused on the fortress city of Teruel (a World Heritage city designated by UNESCO). As a vital area for Mudejar art, a style influenced by Islamic tradition and more contemporary European architectural styles, Teruel’s extensive use of brick and ceramic tile on centuries-old buildings and façades serves as a timeless testament to the importance of ceramic tile as a building material. The Agora (L'Àgora) building within the City of Arts and Sciences in Valencia, Spain, is part of a larger complex of facilities designed by Spanish architects Santiago Calatrava and Félix Candela. With this final installation of a three-part series, I’ll take you on a journey to Valencia where architecture and design have come together to form a cohesive partnership in the City of Arts and Sciences, followed by Cevisama (the annual International Ceramic Tile and Bath Furnishings Show) where new relationships are formed and the latest technological advancements in ceramic tile applications are revealed. 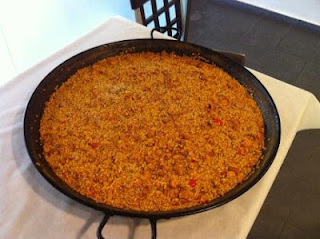 Paella is a Valencian rice dish that originated in its modern form in the mid-19th century near Lake Albufera. There are three widely known varieties of this sumptuous creation (meat, seafood, and a seafood/meat combination. All three versions feature saffron (the most expensive spice in the world) and olive oil. The City of Arts and Sciences (Ciudad de las Artes y las Ciencias), designed by architects Santiago Calatrava and Félix Candela, is a breath-taking complex which consists of five main structures, or elements: the Hemisfèric (IMAX cinema and digital projections), the Umbracle (a landscaped vantage point and car park), the Príncipe Felipe Science Museum (an innovative center of interactive science), the Oceanográfico (the largest aquarium in Europe), the Palau de les Arts Reina Sofía (an opera house), and Ágora, which offers a multifunctional venue for exhibitions, conferences or meetings. Built along what was formerly the bed of the River Turia, the City of Arts and Sciences was envisioned as THE venue for entertaining and stimulating the minds of its visitors with science, technology, nature, and art. 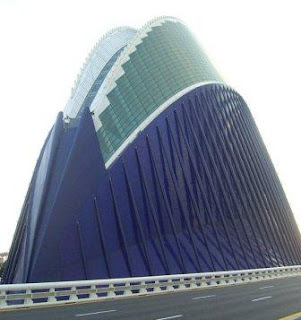 This detailed view of the Ágora building’s façade illustrates how natural sunlight and the reflection of immediate surroundings can play colorful tricks on the eye. 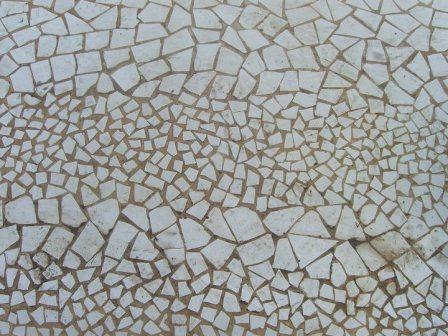 Trencadís is a type of mosaic created from broken tile shards. Millions of pieces adorn the surrounding benches, staircases, and building surfaces of the City of Arts and Sciences. 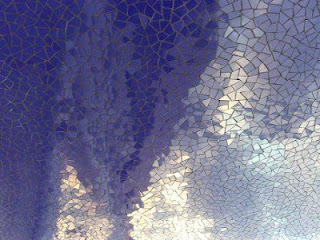 From Antoni Gaudi to Calatrava, and from centuries past, it’s evident architects and builders have relied heavily on the strength and longevity of ceramic tile. Throughout its rich, multi-cultural history ceramic tile has, and continues to play, an integral role in defining Spanish architecture. As a result of this reputation, it’s no wonder that Cevisama attracts not only Spanish attendees, but an enthusiastic global crowd as well. During the most recent edition of the annual show, attendees were treated to mind-bending shapes, sizes, lengths, color palettes and textures. Here are several examples of what was revealed during the 2012 edition of Cevisama. Note: The following images were made available by Tile of Spain. I hope you enjoyed this brief sprint through Spain, a country that I look forward to visiting many more times throughout my life. If you aren't able to get to Spain any time soon, then bring Spain into your home with hand-painted Spanish tile offered by Avente Tile, or by contacting your ceramic tile retailer about the products I highlighted above.